Good morning, all. I trust this finds all of you well and using your iOS devices to their max! As you can tell, there hasn’t been a lot going on in the world of apps that I found worthy of reporting about. Personally, I think the release of Apple Watch has created such a stir in the world of developers that most are waiting around to see how they can incorporate the watch into their offerings. However, today there are a couple of apps I want to tell you about. As you know, one of my favorite and most-used apps is iThoughts HD. It’s a mindmapping app. But I use it as an amazing PIM. The app is normally $9.99. Today it is only $4.99. You save $5.00. If you use your iPhone or iPad to manipulate and create images, you’re going to want to check out Pixelmator. You can do graphic design, photo painting, and other advanced editing of your images with it. And, best of all, it’s now available on both the iPad and iPhone. The app is $4.99. Some of you continue to ask about business card scanning. Well, I use ScanBizCards. And now it’s available for use on your iPad as well as your iPhone. It’s only $.99. The lecture circuit has been quiet while Apple rolls out the Apple Watch. 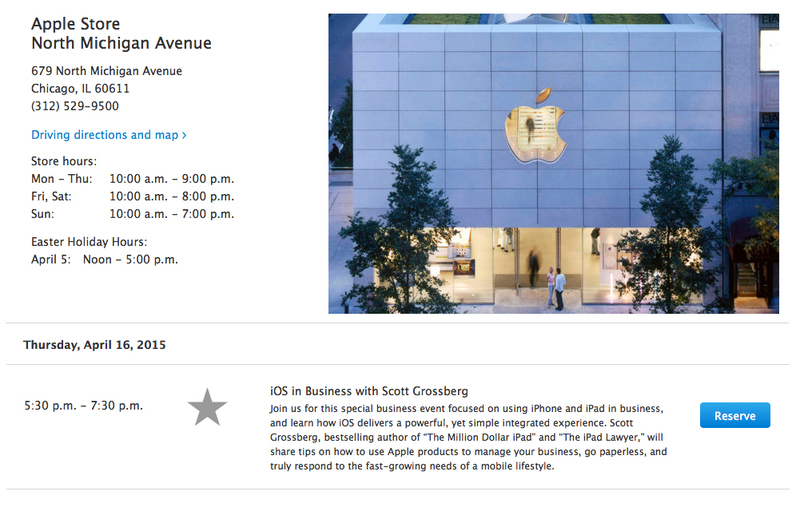 I’ll be appearing, again, for Apple in October up in the San Francisco and Palo Alto. More information to come! Tonight’s the night! 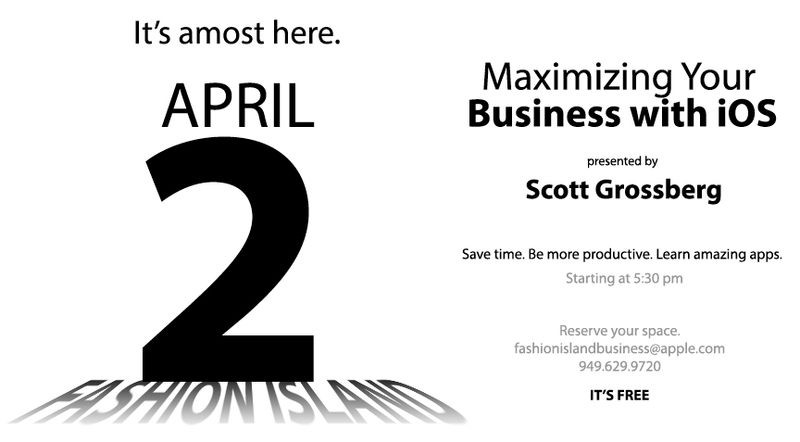 For those of you in Southern California, I’ll be in Newport Beach for an event at Apple’s Fashion Island Briefing Center. I believe there’s still some space available for you to attend (it’s free). But, you have to contact the Apple Business team and let them know you’d like to be there. You can reach Apple at fashionislandbusiness@apple.com. Good morning, everyone. 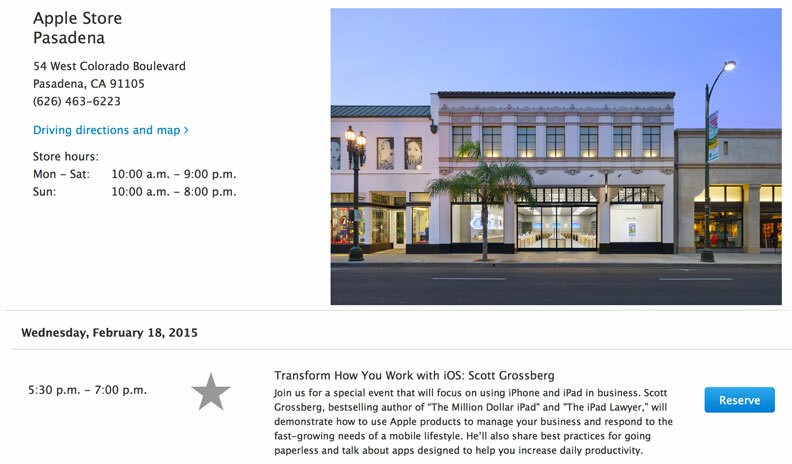 I’m excited about these next two nights because I have two new Apple events for you to attend — one in Pasadena and one in Santa Monica. We’re not going to concentrate on theory or accessories. We’re going to get right down to it and dig into my actual workflow mindset and techniques. Do you want to save time and be more productive? Do you want to automate your content creation? Then these are the seminars for you. And . . . I’ll be bringing these same events to Chicago, San Francisco, and Palo Alto in the near future (more on that later). These events are always a LOT OF FUN! And I can’t wait to meet new friends and reconnect with those of you who’ve attended my other presentations. 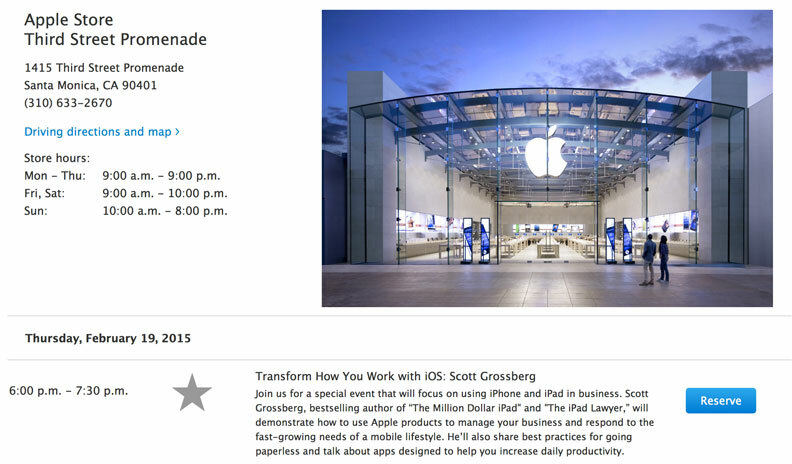 Apple is offering these events FREE for you. And SPACE IS LIMITED. So you can imagine how important it is to reserve your seat ahead of time. Good evening, all. I trust this finds you well and using your iOS devices to their max! I have two new Apple events to announce and . . .
And these events are being offered at two locations, back-to-back. You’ll be learning the latest apps that I use to save time and be more productive. There are really some incredible new AUTOMATED WORKFLOW options you’ll want to implement right away! You’ll be getting my own keyboard, typing, and CONTENT CREATION SHORTCUTS. These, alone, will blow you away. And you’re going to have A LOT OF FUN. Anyone who’s been to one of my Apple events over the last three years can tell you, above all else, these events are game-changers — not just because you learn cool stuff — but because of the people you get to meet and the networking that takes place. Good morning, all. I trust this finds all of you well and using your iOS devices to their max! Let’s jump right into some terrific app deals that will push you and your business even farther . . .
One of my favorite apps of all time is iThoughts HD. It’s a mindmapping app. And it can be used for so much more than simple tracking of your thoughts. I’ve mentioned it before, but I use it for an amazing PIM. The app is normally $9.99. Today it is only $1.99. You save $8.00. For those of you who want to turn your iPad or iPhone into a second monitor for your Mac, you can’t do better than to look at Duet Display. The app is free to download on your Mac. The iOS version is $14.99. Here’s the important part of all this . . . ex-Apple engineers created this and so far there is no lag between displays. Rather than using Bluetooth (like other apps do), this utilizes your lightning connector. For those of you who like to or have to keep meeting minutes, here’s a new app designed just for you. It’s called Minutes. The app is FREE! One more thing . . . for those of you who are using Microsoft Word, Excel, and OneNote — there are some updates available that provide bug fixes and stability improvements. You can get these updates FREE through the App Store on your devices. As to my appearances for Apple, we’re still finalizing some last-minute things. More details will follow. In the meantime, I will be at the following locations in Southern California in February.